(YORK, Pa.) —Wolf Home Products today announced it will be introducing the largest single expansion of products and dealer support services in the company’s history at the Remodeling Show/Deck Expo/JLC Live 2016. Wolf Home Products is a leading supplier of kitchen cabinets and building products in the U.S. The Remodeling Show, which will run October 5-7 at the Baltimore Convention Center, is a three day event sponsored by the National Association of Homebuilders, the North American Deck and Rail Association and Remodeling magazine featuring educational conference programming, professional development and product exhibition. Heading the list of Wolf’s new products is Wolf Transition, Wolf Home Products’ new line of full-access cabinets, one of the most sought-after styles of cabinetry on the market. Wolf Transition cabinets present not only simplicity and contemporary style, but also increased storage, easier access and a more efficient use of space. Wolf Transition cabinets will be available in 17 door styles and 37 finishes. Visitors to Wolf Home Products’ booth will be among the first to see and handle the new products and talk with the team of Wolf Home Products experts. For more information, click here for the JLC Live website. About Wolf Home Products Wolf Home Products supplies kitchen and bath, outdoor living and building products using its innovative business model. With more than 170 years of experience and a vast inventory of high-quality products, Wolf strives to accurately deliver orders in a fraction of the time to ensure unparalleled satisfaction and value. For more information, go to wolfhomeproducts.com. Continuing a long tradition of introducing innovative building materials for independent lumber dealers in the Northeast U.S., Boston Cedar is pleased to announce its newest offering; RDI Metal Work’s Excalibur Railing. The folks at Railing Dynamics Inc. have taken elements you’ve come to love from the Endurance and Titan Pro railing systems and created Excalibur, the new railing line from the Metal Works® family. Endurance-like hidden attachments, Titan-like easy installation, economical, and sleek satin black or hammered bronze finishes, are all combined together to create a great looking fully-metal exterior railing system. Sure, metal has been around for a while, but you’ve never seen it quite like this. Excalibur’s pre-welded components provide strength, while the triple-coat finishing process ensures great looking durability. The pre-mounted brackets allow for quick installation. 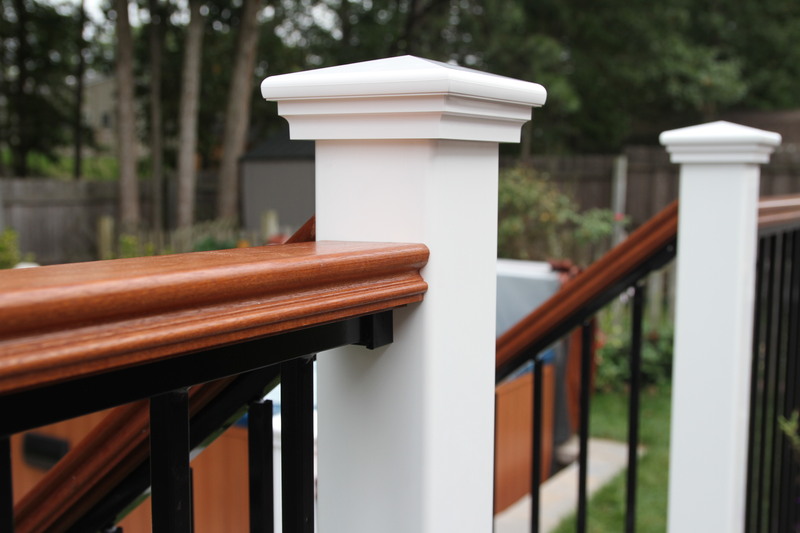 The satin, low-gloss finish hides marring, fingerprints, smudges and other dirt that can otherwise make a gorgeous railing installation look like it’s in desperate need of a spit-shine. Excalibur doesn’t have to stop at being a suit of armor for your deck, porch or set of stairs; you can add a touch of warmth and beauty to the toughness of steel. Create a touch of elegance with a custom wood top-rail profile. Mix it up by combining white, earth, or sand post and accessory options from the Endurance and Titan systems. At the recent JLC LIVE New England Show in Providence, RI, contractors flocked to the RDI booth to learn more about Metal Works. During the course of live product demonstrations, contractors were enthusiastically supportive of the ease of installation, the 15-year residential, 10-year commercial limited warranty on materials and the game-changing 2-year labor warranty. February 15, 2011 | We have some exceptionally awesome news! NADRA is hitting the deck running with a brand new education series launching in March. Join us during JLC Live for a NADRA dinner reception followed by a day of deck-specific education. Are you a NADRA member? This course is one of a four-part series designed to help contractors prepare for their NADRA MDP Certification exams (NADRA Master Deck Professional Certification*). Flaunt your certification in your proposals, website, marketing and be recognized on www.NADRA.org. We will even give you a shout out in NADRA’s blog and in our weekly news brief! • NADRA Deck-specific education will be held on March 24 starting at 8:30 a.m. EST, running all day. Lunch will be provided. See below for course descriptions. • All happening at The Biltmore in Providence, R.I. – more details to follow! * This event is open to members and non-members alike. Certification is only offered to current NADRA members. Online registration begins Feb. 22 for: NADRA Dinner and Full Day of NADRA Education — More details and pricing to follow.